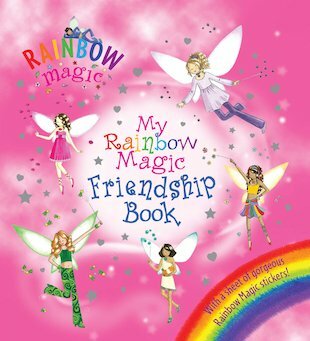 A book of magical tips on how to be a true friend. It’s full of fairy fun! This rainbow-bright book is bursting with colour and sparkle, from its cute padded cover to its sweet Rainbow Magic stickers. Inside it you’ll learn everything you need to know about being a true friend: the Fairy Friendship Promise, the fairy friend trail, and the seven special friendship spells. Play the name game! Give a gift! Take a friendship quiz! Write in facts about your friends! With so many sparkling spells and secret wishes to share, you’re sure to stay best friends forever. I think that this book makes magic really come to life. The characters are fun,unique and exciting.